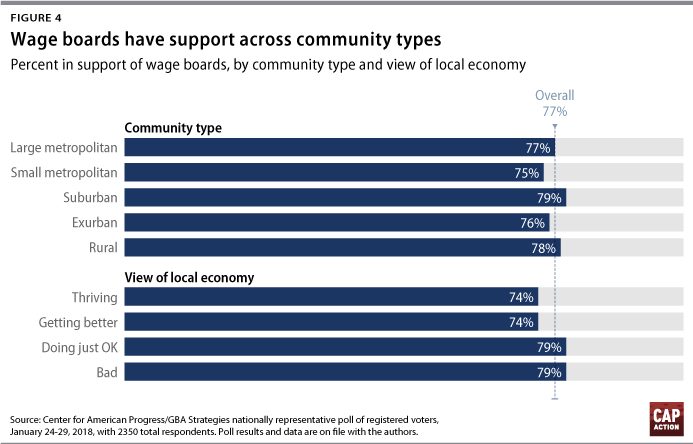 Recent polling conducted for the Center for American Progress shows very strong support for wage boards—a policy that brings businesses, government, and workers together to set minimum wages and benefits across industries. This level of support is unsurprising considering the real challenges that many American workers face today. While those at the top have pulled further away, typical workers have seen their pay barely grow over recent decades. CAP and the Center for American Progress Action Fund have been a strong proponent of wage boards as a part of labor law reforms necessary to raise wages, improve working conditions, strengthen worker voice and power and move toward true industrywide bargaining. It is crucial for policymakers to take steps to allow more workers to collectively bargain and to encourage bargaining above the firm level. One way to move toward such a system would be to expand the use of wage boards, which bring representatives of workers, businesses, and the public together to set minimum workplace standards for industries and occupations. All workers would be covered in a given industry or occupation—whether or not they are considered independent contractors or employees, as well as whether or not they are union members. Wage boards could set wage scales for particular positions and skills, benefit and scheduling standards and requirements on profit sharing, though all standards would be minimums that workers and their unions could seek to improve upon. Such a proposal would be paired with other reforms that would help restore balance to the United States’ current labor relations system—which favors employers, not workers. Once worker organizations become stronger, wage boards could evolve to include more direct bargaining between worker representatives and groups of firms. 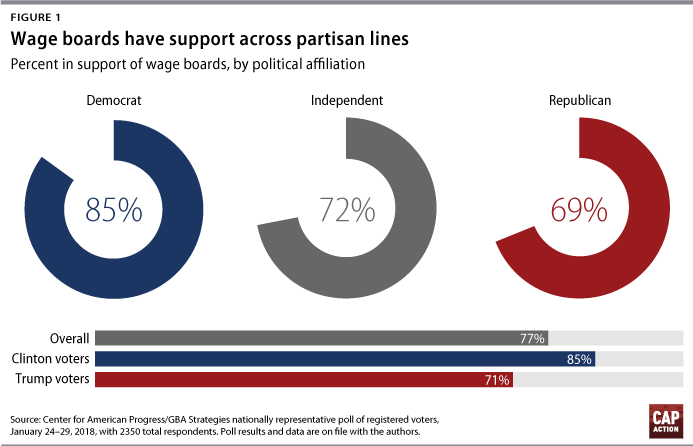 The comprehensive, nationally representative poll conducted in January 2018 found that 77 percent of registered voters supported the creation of wage boards. Support was remarkably broad across age, race, education, geography, income, and party identification, with strong majorities of virtually every demographic group favoring the policy, as the tables below show. Both traditional Democratic constituencies—such as women, at 82 percent—and groups that tend to support Republicans—such as white voters without four-year college degrees and voters who live in rural areas, at 79 percent and 78 percent, respectively—expressed very high levels of support. 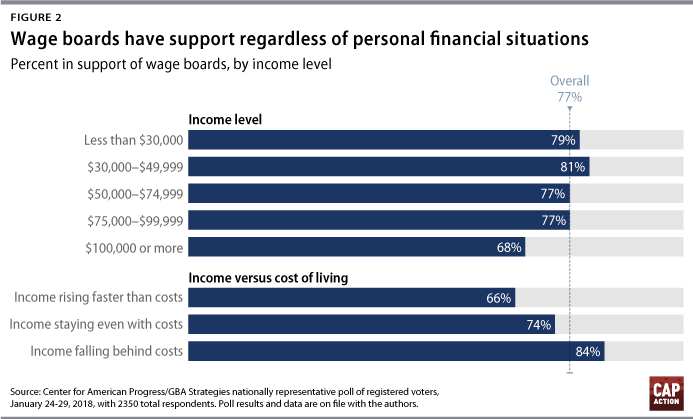 Support was especially strong among people who felt their income was falling behind the cost of living, at 84 percent. The poll also found strong support for a number of other proposals, such as investing $1 trillion in infrastructure and enacting paid family and medical leave. These findings suggest that the American public wants bold action to make the economy work better for them. 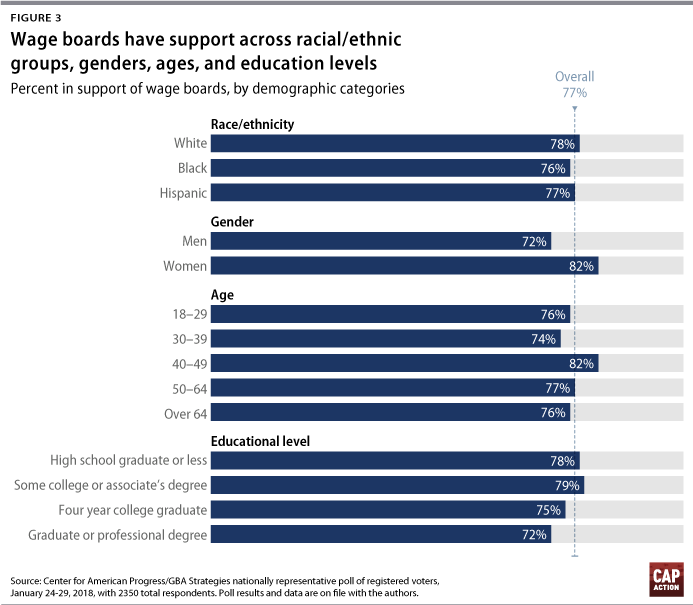 Wage boards have been gaining visibility in recent years as a growing number of academics and policymakers recognize their ability to raise wages, reduce inequality, and help boost productivity. New York state, for instance, used a wage board to raise fast food workers’ wages to $15 an hour. There are ongoing efforts in Seattle and Maine to adopt wage boards for domestic and in-home care workers, respectively. Too few workers today see their pay and benefits improved through a collectively bargained contract. Wage boards would help move the country toward a system where millions more workers would share in the benefits that come from union representation. The poll results provide one more reason why it is time for policymakers to consider creating wage boards to improve all American workers’ pay and benefits. David Madland is a senior fellow and the senior adviser to the American Worker Project at the Center for American Progress Action Fund.